Superb holiday rentals in St Andrews and the idyllic villages along the coast, many with direct beach access and golf course views. Whether a family gathering or romantic getaway, choose from our bespoke selection of luxury self-catering homes in the East Neuk of Fife, many that allow pets to come too. We have been welcoming guests to this stunning part of Scotland for over 15 years, be it a golfing break in St Andrews or one of the other historic courses close by, or a classic seaside family holiday. Spectacular scenery awaits you in our little piece of heaven. Daily housekeeping / catering / fridge stock / breakfast packs on request. We have an extensive portfolio of holiday cottages to rent in East Fife. For last minute deals and offers please either click here or phone us on 01333 330241. Click here for a list of properties where your dog can come too. Modern and contemporary home built within an old Victorian School (circa 1896). Spacious interior with high ceilings, large windows and white walls. Roof top views of sea from both larger bedrooms. Superb location, 2 minutes from the Fife Coastal Path and 5 minutes from the best fish and chips on the planet!! Anstruther itself is a lovely village with a small marina, shops and cafes. St Andrews - Home of Golf - is a fifteen minute drive. Elie, with its wonderful beaches and the Chain Walk is 10 minutes in the other direction. 4 bedrooms (master bedroom en-suite with king-size four poster, second bedroom with superking bed that can be split to two singles, bedroom 3 has two single beds and bedroom 4 a single bed with pullout trundle bed. Small front garden with bench to catch the morning sun, and decking at the rear with garden furniture for your al fresco dining. Two car parking spaces at the rear. Please note bookings for this property during School Holiday periods run from a Friday to Friday - outwith these periods we can be flexible. 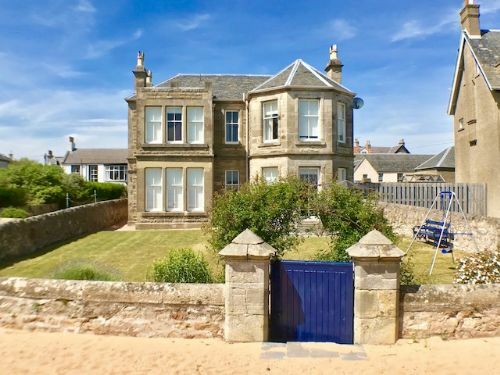 Detached cottage situated in a beautiful coastal location amongst the pretty steadings of Caiplie which lies between Crail (1.7 miles) and Anstruther (1 mile). Furnished and equipped to an exceptionally high standard, all the accommodation is on the ground floor and sleeps 6 adults and 1 baby (travel cot provided). For winter guests there is an open fire in the sitting room in addition to full gas central heating. Wireless Internet is available. The Gatehouse has access to a sheltered shared courtyard garden and has its own private patio equipped with attractive garden furniture. There is a secure garage offering safe storage for bikes and private designated parking for two cars. The area abounds with beautiful beaches. The most magnificent are probably found in Elie and St Andrews. North East Fife boasts many first class restaurants. Early booking at some restaurants is essential to avoid disappointment. The area also boasts some of the finest golf courses in the country - nearby Crail is home to Balcomie Links and Craighead Links. St Andrews (9 miles) is home to some of the most famous golf courses in the world. Elie, Leven and Lundin Links offer very good links golfing. Fairly recent additions to the established clubs in the area include Kingsbarns Links, the Dukes Course above St Andrews and the new 36 hold layout at Kingask. 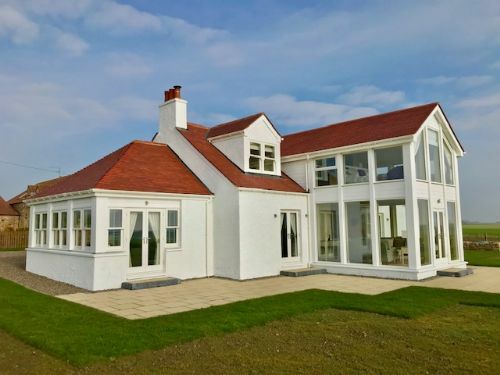 Stunning sea and countryside views are offered from this luxury newly renovated 5-bedroomed Farmhouse, bright, airy and contemporary open plan living at its best. 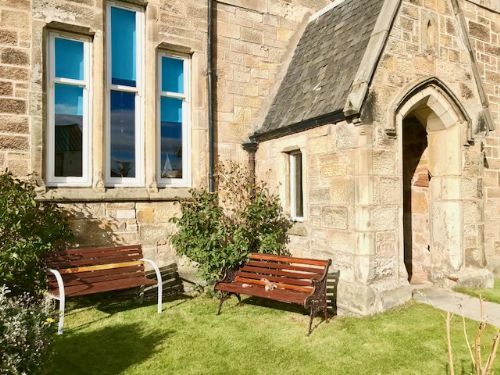 In a peaceful rural location, yet just a short 5 minute drive into the popular fishing village of Anstruther which offers 9 hole golf course, wildlife cruises to the Isle of May (home to the UK’s largest Puffin population) and an array of restaurants from award winning Fish & Chips to The Cellar (Michelin Star). This is an ideal house for large groups - there are two comfy living areas - the open plan kitchen / living area providing a very social space. St Andrews, The Home of Golf, is 9 miles away and Dundee with its latest addition the V & A just 23 miles. The garden ground surrounding the farmhouse is perfect for BBQs, and ample private parking. The Kingdom of Fife in Scotland is situated between the Firth to Tay and the Firth of Forth, an hour’s drive over the Forth Road Bridge from Edinburgh. Knicknamed the Golden Fringe of Fife, the East Coast boasts a variety of attractions and facilities with something to suit all ages - but best known for its long stretches of sandy beaches, characterful fishing villages, stunning scenery and wildlife (dolphins and whales often spotted off the coast), and numerous golf courses including the famous Old Course in St Andrews. For walkers the Fife Coastal Path runs from Kincardine to Newburgh taking in all of the breathtaking scenery and wildlife, whilst passing through the charming fishing villages and historic towns along the way. For those who enjoy cycling Fife has one of the UK’s most comprehensive cycling networks with over 350 miles of sign posted routes. There are many local attractions available to keep the children occupied, including tennis, watersports, golf, play parks, wildlife centres, play parks, or just playing sandcastles on the beach. Or, if you just want to chill, enjoy dining out in one of the many award winning restaurants and pubs in the area, take in the sea air and relax! !